Here is the puzzle to given twist to your mind. School going students can test their Mathematical, Logical as well as observational skills using this mind puzzle. 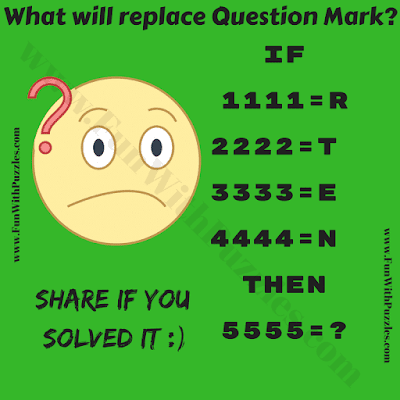 In this mind puzzle, some numbers are equated to the single letter. Your has to decode this relationship between these numbers and letter and the find the value of last equation. Are you ready to solve this mind puzzle? Can you solve this Mind Puzzle? Answer of this "Mind Puzzle in Picture for Students", can be viewed by clicking on button. Please do give your best try before looking at the answer. e.g fouR, eighT, twelvE and twentY. Right side of the equation is last letter of this written word.